Deferred Consumption: Can we cut taxes and supercharge growth?! Can we cut taxes and supercharge growth?! So it's a tenet of the Republican faith that lower taxes help economic growth. But is it true? A friend recently linked to this NYT piece about a recent non-partisan study which said there's no relationship between taxes and growth (and was withdrawn because of Republican pressure). Ostensibly, the Republicans had the report shelved because of methodology problems, but I'll leave that for you to judge. This type of thing isn't that hard to determine on our own. I'll give you a simple graph with minimal commentary and let you decide. First, we're pulling data from the reputable (and awesome!) FRED archive here. 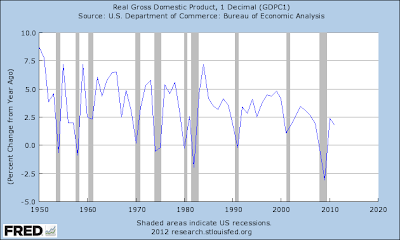 The following shows economic growth since 1950 (in terms of annual percentage change in real GDP). It's pretty well understood that taxes were high in the 1950s through 1970s and significant tax-cutting started in the 80s under Reagan (with his second notable tax cut coming in 1986). 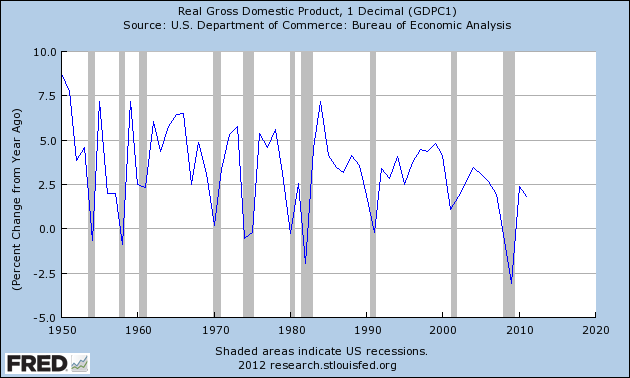 Now, notice how often the economy reaches 5% growth before and after that year.